Ordained in 2011, Father Friel served for five years as Parochial Vicar at St. Anselm Parish in Northeast Philly. 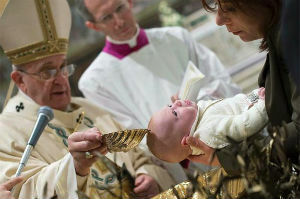 He is currently studying toward an STL in sacred liturgy at The Catholic University of America in Washington, D.C.
URING THE course of the November 2017 meeting of the United States Conference of Catholic Bishops (USCCB), the Latin Rite bishops gave approval to the “gray book” of the Order of Baptism of Children. The “gray book” is the final draft of any new translation by the International Commission on English in the Liturgy (ICEL). This translation, therefore, is ready to be sent to Rome for approval. 1. A new “sample introductory monition” has been composed and included before the opening dialogue. 2. A sample acclamation to follow each Baptism is provided in the text. 3. Several rubrics have been altered to make clearer ritual variations that are already permitted (e.g., the option to omit the anointing with the Oil of Catechumens and the Ephphatha rite). 4. An optional, extended version of the Litany of Saints has been added to the chapter of “Various Texts” for use on more solemn occasions. 5. An appendix has been drawn up to facilitate the celebration of Baptism within Mass, in accordance with the instructions already provided in the praenotanda. The first three of these adaptations have already been made in the Spanish version of this ritual book (Ritual para el Bautismo de los Niños); the last two are entirely new adaptations. IGNIFICANTLY, this is the first ritual book that will be sent to the Congregation for Divine Worship and the Discipline of the Sacraments (CDW) by the USCCB since the publication of Magnum principium. The confirmatio will be sought from the CDW for the translation, while the recognitio will be sought for the adaptations. It will be interesting to watch how the confirmatio and recognitio processes unfold in light of Magnum principium.